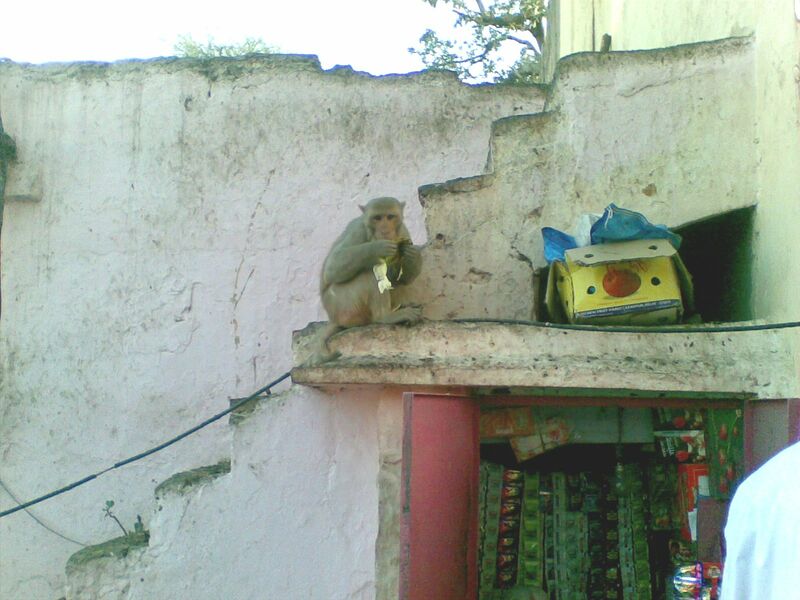 This monkey sitting on the parapet was so engrossed in feasting on his banana that he didn’t mind me clicking his snap. As I entered the ‘Govind Devji Temple’ in Jaipur, the sight of these monkeys besides the usual security officers was a refreshing change. Situated in the heart of the city, The City Palace complex, this is “the temple” of Jaipur, adored and revered by one and all. Not surprising then, my trip to Jaipur always starts with a visit to this temple. Bathed in the golden rays of the blazing sun, this spireless temple looked beautiful. The number of people coming out of the temple were far more than the number trickling in, a clear indication that the deity room had just closed. The temple is known for its unusual timings, the darshan opening and closing every few minutes. The temple room is quite huge and airy. The finely carved floral patterns on the walls, washed in what else but pink with sunrays filtering in from small dents in the roof was accentuating the fascinating beauty of the temple. After many minutes of gaze, I was interrupted by the beautiful kirtan that was going on in the temple room. 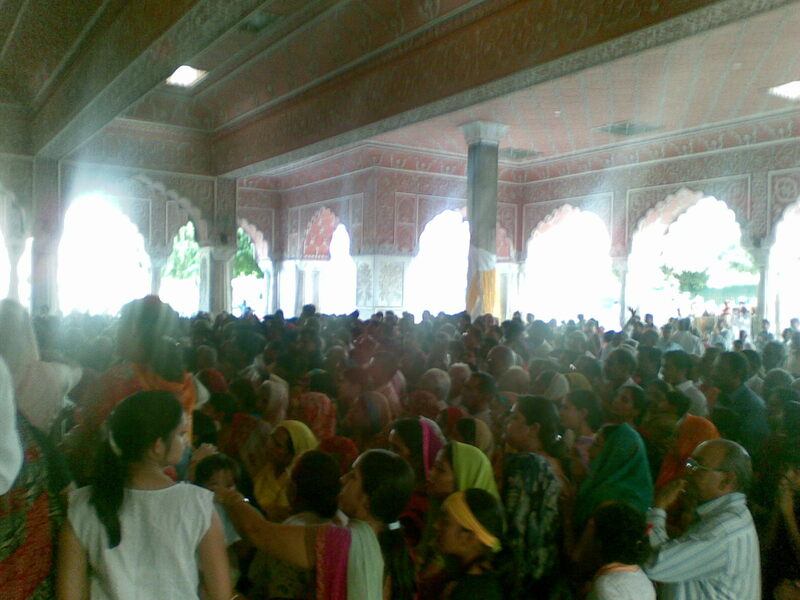 There were these women sitting together in a group singing devotional songs. “When will the darshan open,” I enquired one of them. “Have patience,” she replied with a smile, “the fruit of patience is sweet”. The room had filled in by now and the place was abuzz with activity. Everyone was anxiously waiting for a glimpse of Radha Govind. The deities of Lord Govind Devji along with His beloved Radha glittered as the priest lit the aarti lamp. All the people present there joined together in song and became one – one group united in devotion, with smiles and tears – so many varieties of dance. The joy on the faces of the ladies as they raised their arms and danced; the bespectacled men, smiling with their missing teeth, clapping their hands and crying out, made for a blissful sight. You could feel your heart tugged along through so many emotions, joy and pain, wonder and regret, all sublime, all so nourishing, satisfying and edifying the experience. I was there somewhere in the middle of the crowd and it was such a joy to see everyone take such delight in the aarti. There was hardly any jostling and people were trying to look over the shoulders for a better view. Slowly, I made my way through the crowd to get a closer look of Him. The Lord looked beautiful and pleasing in His entire shringar splendor, ornate with sparkling jewels, long flower garlands touching the bunch of Tulsi leaves covering His feet…. What a divine darshan I had! Exquisite pictures of the temple... its such a shame and pity that we in India do not advertise our heritage enough!! In foreign countries, they have such less monuments of architectural significance, but they hype it so much. A tiny town will comprise of a city centre, market square, Tower, one tiny museum and a palace. That's it. And they do such a good job of making it an awesome tourist spot. I wish we could do the same in India. We just have sooooo much more!!!!! It was nice to have darshan of Radhe Govind early in the morning. Enjoying the trip along with you. This was very interesting.... and the intricate carvings are beautiful! Wisdom lies inside the fruit of patience that is sweet. What beautiful colors, a lot of pink! How often are these services? How long is the room open? I don't think I've seen a temple with a flat roof, but it is just as beautiful inside, I wonder how long it took to do all those wall carvings, so much detailed work! I love the way the monkey seems to glance up from his banana just as you take his picture. I love the colours of this temple, so warm and earthy, they are beautiful. Thanks for your very nice comment on my blog, too, my dear! You do a wonderful job with your photographs. i am a filipino but your post makes me wanting to go to interesting place like rich cultured india. Great Post btw...I am always a big fan of bloggers who illustrate their write-ups with images! I have had a similar post on my mind on my visit last year to Belur/Halebidu- these two small towns have soe of the most exquisite temples built a few hundred years ago, but never been so recognized even nationally..I really enjoyed my visit here and I hope to capture them in this post. MOnkeys are a common sight at temples here in Thailand too - particularly in some provinces. Thanks for another fascinating post with great photos. Hi Arti, thanks for visiting today! Am sending you a cupcake - close your eyes and you can see it and taste it ;) Hope you have had an intersting day! Hi Arti..thanks for giving us such s beautiful glimpse of the local history..I could sit in that temple hall for hours it looks so peaceful! i love how intricately designed the temple is. What a gorgeous temple, and your photos are fantastic. I'm glad they didn't prohibit taking the pictures in the temple! Atleast someone have vision like this.I respect you from my heart for showing the forgotten heritage of India.Great post and photographs Arti. the walls are just so beautifully carved! Awesome articles Arti, just loved them. Your articles made an excellent guide for my travel to Jaipur. Beautiful temple, and the women are dressed in such gorgeous saris. Thanks for the link to this post, Arti. 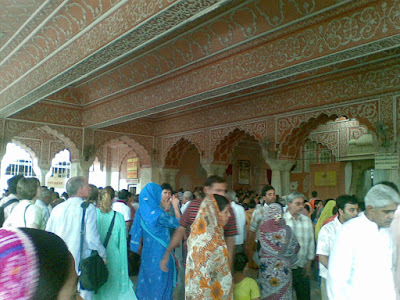 Hi I am from Jaipur Only, Nice informative Article and lovely Pictures. I could almost feel the atmosphere in the temple, Arti. Beautifully written. 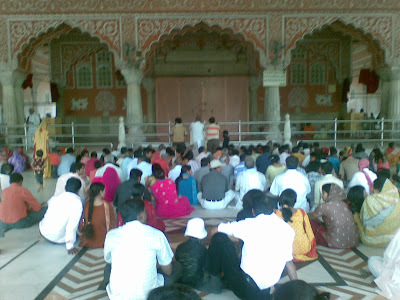 One can surely visit the beautiful temple through this article. Jaipur is on my wish-list.